Tired cliches, unoriginal story...a circus of disappointments." Two couples on their way to a concert run into a little trouble in Ohio. One loses her phone and the person who finds it tells her to meet them Clinton. The couples are not far from that town and they agree to meet the man on the phone to retrieve the lost phone. They arrive only to find what appears to be a ghost town and they wait. Hours pass and the frustrated couples decide to leave in hopes of making it in time to catch their concert. Once back in their car they tried to start it only to learn that something was wrong. A quick look under the hood shows cut wires. Stranded they set out to find a phone. 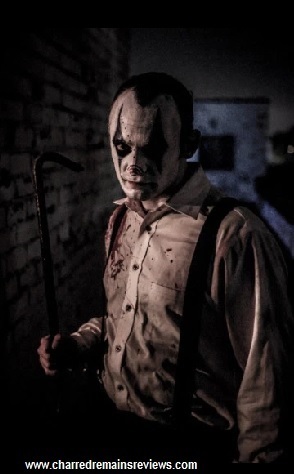 One of the men Mike (Andrew Staton) sees a figure in the shadows of an alleyway and calls out only to be ignored. The others: Brad (Brian Nagel), Mike's girl-friend Jill (Katie Keene) and Brad's girl-friend Sarah (Laura Compton) clearly do not want to ask the stranger for help, they want to keep moving. Mike turns for a moment to look at his friends and when he glances back once more towards the stranger...he's disappeared. and he is wielding a crowbar. Another clown appears and another and the men and women freak. Clowns are supposed to be cute and funny not psychotic and deranged. 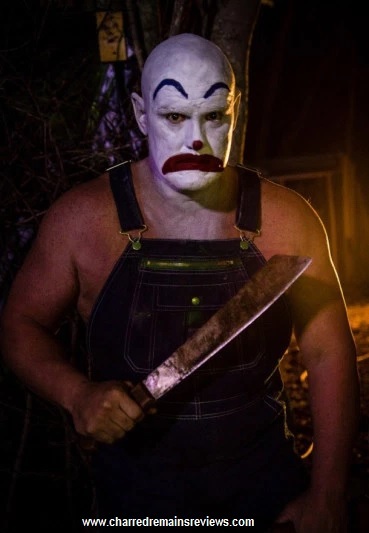 As one of the clowns pours gasoline down on the driver of the truck and strikes a match all assumptions of what a clown should be goes up in flames and screams as the remaining five scatter. 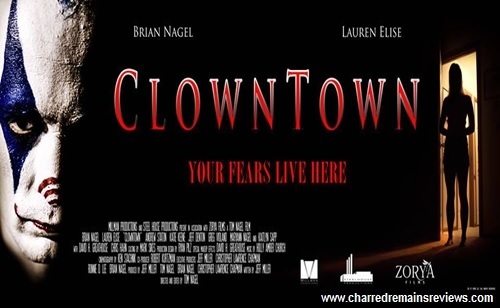 Welcome to Clinton, Ohio the main setting for a new clown horror slated to hit theaters September 30, 2016 and then On Demand October 4, 2016. 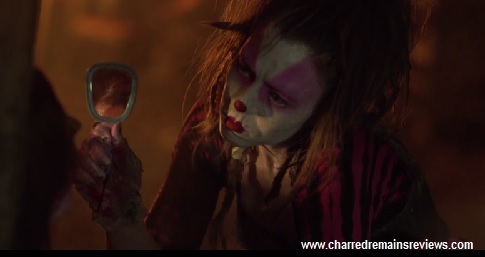 The low-budget clown horror film has been praised by my peers (fellow bloggers/horror commentators) and I expected to be wowed by this film. However, I was not. By the middle I was yawning and at the end I was scratching my head and wondering if I fell asleep and missed the pivotal reason behind the clown attacks. I started the film over and watched it again and I was still questioning the why of the clowns. The film opened with a babysitter reading to young children and ended in her being cleavered. References to Halloween were most obvious with the children's last name being "Strode" and the young boy Ricky dressed like a clown. I couldn't help but groan as the film started with the homage not because I don't love Halloween, but I was afraid this was just going to be a knock-off of it. Fifteen years pass after the death of the babysitter and Mike, Jill, Brad and Sarah enter on their way to a concert. After the altercation with the above mentioned clowns they receive assistance from an older man who hides the couples. Inside his "home" he tells the men and women how a terrible train derailment fifteen years ago caused the town to fall into decline and then the clowns came. End of explanation. The whole direction of the film was "off". Started with opening scene which is meant to give insight to the events that took place prior to couples arrival, but it fell flat. The clown attacks are never really explained as in why they are there or what sets them off. But if the viewer watches carefully in the beginning at the diner where Jill loses her phone, you might recognize certain people who look familiar later the middle and end. But the why of it all is lost somewhere in the storytelling. There is a scene with an old woman and Brad that I thought a-ha now we will get the gist of what's going on and it barely touched the surface of WHY. It did remind me of another horror movie reference with a certain Crystal Lake mother and son simply based on the bond between a clearly insane woman and her deranged misguided son. For me what ruined this film was the story and how one thing didn't connect to another. The town appears to be a ghost town with no one on the streets at night, but that's explained simply people are afraid to come out at night "bad things happen at night". Early in the film we see a diner full of people and a man walking along railroad tracks, but these people are not in the forlorn town of Clinton. A man's death early on is outside of Clinton, so the attacks are not centered only in Clinton. It's not explained and that's frustrating to me. I would imagine it would be to other horror fans. The second element that fell flat was the acting. The only time these characters seemed to not be dull and lifeless is when they are running and screaming...it is that moment that they don't appear to be acting, finally something that look genuine and sounded real. However the women's crying got on my nerves and I actually rooted for the clowns and begged them to silence the whining. 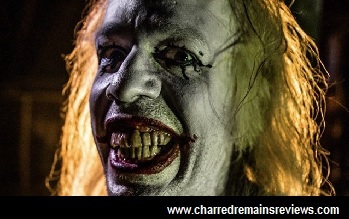 In one such scene a clown walked by a woman bound and screaming and he hit her so hard it silenced her forever. The saving grace for me with this film was the clowns. They were not painted to look cute they looked mean and the ring leader with his wild hair, maniacal stare was excellent. Silent and yet powerful in his performance, the point was gotten that he was not one to mess with. Forget about begging for release, he and his clowns had only one thing on their minds and that was blood. I am a fan of low-budget indie horror films and the one thing that does not factor into my reviews is the budget. IF one writes a good story and adds actors who know their craft, FX both CGI and practical with a director that has a clear vision then budget does not matter. I have seen next to nothing budgets all the way up to big budgets and how much money spent on the making of a film does not matter to me. I am looking for a good solid story, believable actors and FX to allow me to escape for a time into another world, time or place and just get lost in the film; unfortunately it didn't happen in this film. It had its moments, but the overall let down was the "why". The direction of the film felt stilted and just not cohesive enough to hold my attention. I began looking at my watch twenty minutes into the film and check to see how much was left. I wouldn't say it was terrible, but I will say it was flawed in story clarity. The SFX is cool and the clowns are insanely wicked. I'd wait for On Demand or Redbox. This is just my opinion and it may differ from others but I was asked for mine and I've given it. My all-time favorite clown horror is still Stephen King's It.